I like spicy food. The Doctor-in-Law like likes it. He’s a great cook, so I must sample everything he makes…only sometimes my reaction is not so favorable. 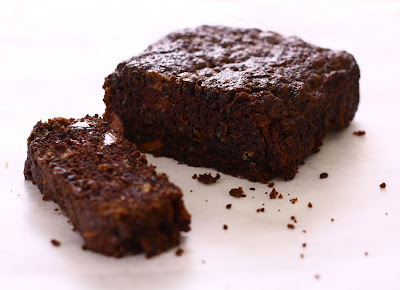 This year at LOTOJA, the D-I-L packed his superamiga support crew some of his homemade spicy chocolate zucchini bread. (Sure beat the half eaten Clif bars the cyclist was leaving me in his musette bags.) I knew I must try it. I also knew there was a chance I might regret it. I didn’t. This bread was moist, fudgy, absolutely delicious… And as I was eating it, I felt my mouth just start to tingle. Chocolate and Cayenne pepper? Don’t knock it until you try it. Preheat oven to 350 degrees F (175 degrees C). Grease two 9×5 inch loaf pans and dust with cocoa powder. In a microwave-safe bowl, microwave chocolate until melted. Stir occasionally until chocolate is smooth. In a large bowl, combine eggs, sugar, oil, grated zucchini, vanilla and chocolate; beat well. Stir in the flour, cocoa, baking soda, salt and cinnamon. Fold in the chocolate chips. Pour batter into prepared loaf pans and bake in preheated oven for 50 to 60 minutes, or until a toothpick inserted into the center of a loaf comes out clean. *As a rule, I generally omit nuts from baked goods. I love them in trail mixes and salads, but not breads, cakes or cookies. So when I made this, I just added the cayenne and extra 2 T of sugar (no water or 1/4 t salt) when I added the dry ingredients. Also, Dr. B’s original recipe doesn’t call for the cocoa powder, but I like mine with a little deeper chocolate flavor.